embrace and employ total quality management to ensure an unprecedented level of quality control and on time delivery of the strongest and best quality laminated glass-clad polycarbonate in the marketplace today. 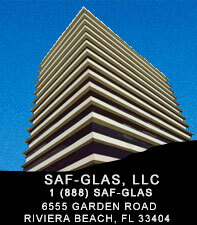 SAF-GLAS offers clients residental, commercial, and industrial design solutions. We also offer project cost evaluations, code insight and technical support. With our ongoing commitment to research and development we continue to keep SAF-GLAS on the cutting edge of technology.